Kristine Leahy is a successful American sports journalist. This gorgeous lady certainly has one of the most enviable jobs in the world. As a sports reporter, she often rubs shoulders with some of the biggest superstars in the world of sports. They include the likes of Deontay Wilder (heavyweight champion), Josh Reynolds (NFL wide receiver) and Jeff Green (NBA Forward). Leahy dispels the wrong notion that ladies and sports do not mix. Find out more about her herein, including her bio, age, height, net worth and of course, juicy details about her love life! Kristine Leahy was born on the 16th of October 1986. There is no information about her family except that her father’s name is Sean Leahy and that she has two younger brothers. Leahy grew up in the city of Chicago, Illinois and had her education at Prairie Ridge High School Illinois. She graduated in 2005 and moved to the New England Area for college. She studied Journalism at Boston University and obtained her BSc in 2009. Kristine Leahy was motivated to go into sports journalism when she was just a child. While growing up, she loved singing and taking part in musicals, as well as plays. She, however, realized early that it was not a viable career option for her. She, therefore, decided to explore her love and passion for sports. While in college, she focused on sports journalism. She also joined the school’s TV station known as BUTV. She helped create the first sports talk show on BUTV which she equally hosted. Upon leaving college in 2009, Kristine Leahy joined a local sports radio station known as WEEI. She spent a year there as a reporter and host. Upon leaving the station, she joined NBA side, Boston Celtics. She spent three years with them (2009-2011) and covered various activities of the team. Kristine Leahy left the Celtics for Fox Boston in 2011 and spent a year there, covering professional sports teams based in Boston. She moved to L.A. in the year 2012. Since landing in the City of Angels, she has worked as a sideline reporter for CBS and Turner Sports. Her beat involved covering March Madness – the climax of college football and basketball season in America. Kristine Leahy currently works for Fox and has served as host/co-host of various shows on the network – one of them is The Herd with Colin Cowherd. This is a sports talk show and Leahy serves as the show’s news anchor. Another one is American Ninja Warrior – a sports entertainment competition during which competitors are required to overcome various obstacles. Leahy has hosted the show since 2015. 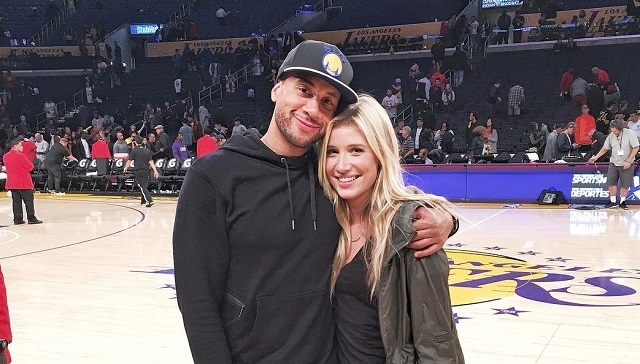 Kristin Leahy also has her own show, known as Fair Game with Kristine Leahy, which debuted in October 2018. It is a talk show and features up-close and personal interviews with sports personalities. Conservative estimates put Leahy’s net worth at $2 million. The Chicago native certainly deserves commendation for succeeding in a male-dominated industry. Her achievements have, however, not come without some hiccups. She has had to deal with several challenges including sexism but has managed to come out on top due to her determination. Kristine Leahy has received several awards for her exploits in sports journalism. She received the 2016 Gracies Award (On-Air Talent Sports) for her work on the show, The Herd with Colin Cowherd. The stunning Leahy is not married (yet) but she is in a relationship with Aaron Hines, a renowned fitness instructor and personal trainer. He is a training director at popular workout outfit, Cycle House. He has also appeared on the E! Reality TV series, Hollywood Cycle. Additional information on Aaron Hines shows he is an alumnus of the University of California and has worked for pharmaceutical companies such as Pfizer and Allergan. The exact timeline of Leahy and Hines’ relationship is not known. However, it is not hard to see that they are very much in love. Kristine Leahy is 5 feet 10 inches tall (1.78m) and weighs 65kg or 143lbs. Other additional measurements are waist – 25 inches, chest – 33 inches and hips – 35 inches. The TV personality also has green eyes and blonde hair. Leahy would have no problem maintaining her slim build, seeing as her boyfriend is a fitness instructor.